The outgoing head of Iron Acton Primary School will the honoured at the villages May Celebrations this year. Jill Bendeaux will crown the May King and Queen when they arrive at the village green during the celebrations on May 4. Mrs Bendeaux is retiring at the end of the School Year and the May Day organisers say she will be greatly missed by the pupils, their families and staff. 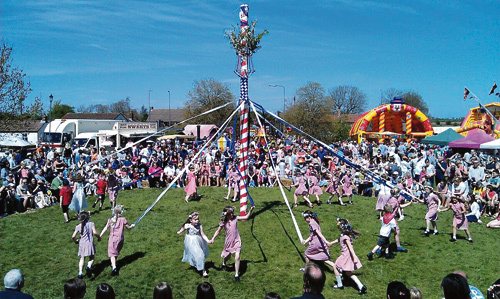 Annie King, part of the organising committee, said; “True to form, this year’s May Day will be filled with many show-ring acts, traditional fairground rides, numerous free activities, local craft gift stalls, food and drink tents, music from Westerleigh Brass Band and a return visit from the Dixie Belles. We are so excited to have the Dixie Belles joining us once again. They will round off the day with one hour of their 1940s and 50s three part-harmonies”. If you would like to get involved with the Day or to hold a Stall, please contact Annie on anniekinghome@gmail.com for more details. The Day opens at 10.30am and ends around 4pm.